IOTA (MIOTA) News – Why is IOTA (MIOTA) losing value? In recent times, there have been plenty of positive developments revolving around Iota (MIOTA). While there have been impulses in between but when you look at the longer term performance of iota (MIOTA), it has been completely lackluster. Due to this very reason, many investors are trying to figure out why Iota (MIOTA) is losing value. 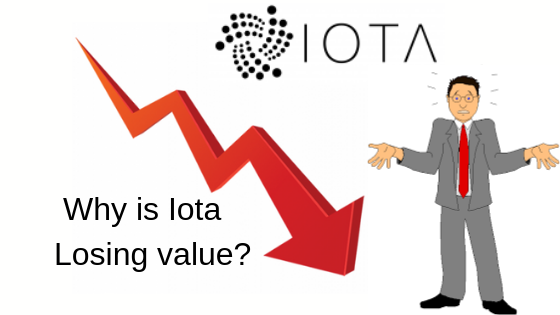 Why is IOTA (MIOTA) losing value? If you look at the intraday performance of Iota (MIOTA), it is up by 3%. However, when you look at the three-month performance, it has lost approximately 10%. It is a clear indication that in spite of the many positive news, in the longer term it is not performing that well. The question which many investors are asking whether it can lose more value. Most of the fundamental news of iota (MIOTA) are long-term in nature. They do not impact the demand of iota (MIOTA) in the shorter term. That is why, other than sentimental value, the impact is pretty minimal. Iota (MIOTA) gains on these news on a shorter term basis and then retraces all the gains again. That is why, in the past quarter itself, it has not gained a lot. One of the main reasons why investors are bullish on iota (MIOTA) is because it can integrate iota devices quite easily. The problem is that the adoption is on the slower side. The market is crowded with many companies offering such integrated devices. Very few of these companies actually use blockchain technology. They use app-based platforms and cloud-based systems to integrate such devices. That is why, in spite of the fact that iota (MIOTA) offers excellent infrastructure for iota devices, the adoption has been on the lower side. It is one of the reasons why it has not been able to gain much. Another problem has been the lacklustre cryptocurrency market. The general trend is such that cryptocurrency is gains in one week and then gives up all the gains in the corresponding week. The momentum being on the negative side does not help either. If you are a current investor in iota (MIOTA), you can wait it out. However, the game is pretty tricky for new investors. You need to conduct more due diligence and wait for tips before investing in it. It remains to be seen when the various fundamental initiatives undertaken by iota (MIOTA) finally result in higher demand. Cryptojacking News – Is Cryptojacking legal in some parts of the world?